Souleymane Coulibaly celebrates a goal for Posh in a 5-1 win at Oldham. Photo: Joe Dent/theposh.com. Peterborough United manager Graham Westley admits his side’s 5-1 drubbing of Oldham earlier this season will have no bearing on tonight’s League One clash between the teams at the ABAX Stadium (February 23, 7.45pm kick off). Posh approached that game at Boundary Park in September in terrible form. Dave Robertson had been sacked as Posh boss seven days earlier so Grant McCann took charge of the team with Westley an interested observer from the stands. Erhun Oztumer in action for Posh at Oldham in September. Photo: Joe Dent/theposh.com. And goals from Lee Angol (2), Souleymane Coulibaly (2) and Erhun Oztumer delivered an emphatic win against a desperately poor Oldham side. But ‘The Latics’ have changed manager twice since that game and they’ve started to show decent form under latest boss John Sheridan who is in his second spell in charge of the club. Oldham have won just five of 30 League One matches this season, but they lost just twice away from home. They haven’t conceded a goal in their last three away games in League One, including an impressive 0-0 at high-flying Wigan, and on Saturday (February 20) they came from behind to beat promotion-chasing Gillingham 2-1 at Boundary Park. Westley said: “There have been a lot of changes at Oldham since that match. It will be a tough game for us. “But the players who scored the goals that day are still at the club and it shows that there is still plenty of goal-scoring potential in our squad. Sheridan says his side will travel south with confidence, but he too is expecting a hard game. It’s one he believes his side can still win. 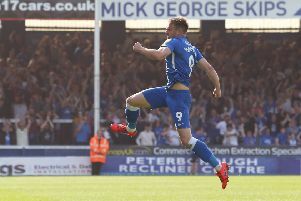 Sheridan said: “Peterborough are a good team. I know they’ve had a 3-0 and a 4-0 defeat in their last two games, but I watched them against West Brom and they looked a half-decent side.